iStockphoto.com: Quality images for "the rest of us"
Sooper.org's PowerPointless has up-to-date links to seemingly every article related to PowerPoint or presentations in the popular online media over the last several years, dating back to 1998. It was there that I found Till Voswinckel's thesis, Presentational Visualisation Towards An Imagery-based Approach Of Presentation Visuals. If you give presentations in your job, even if only occasionally, this is a document you will want to download, print, staple, and give a good read. "Much of the research to be discussed within this work is equally directed at providing scientific evidence to an approach of primarily “visualistic” presentation support. Inspired by Don Norman’s assumption of text as “the last thing people should put on a PowerPoint slide”, a number of cognitive science-related theories such as mental imagery and picture superiority effects will be discussed in order to put forward a conceptive alternative directed towards visual imagery approaches: An understanding of pictorial methodology as being more optimally suited as a means of effective communications in terms of cognition, learning, and persuasion, than the aforementioned, text- and bullet-centric slide paradigms." There is a lot of anecdotal "proof" that the "normal way" of presenting (i.e., boring, dull, accompanied by bulleted lists on slides) is ineffective at best. My own experience — and the experience of many of you reading this, no doubt — is that the best visual support occurs when the presenter's words are synchronized with and augmented by full-screen, high quality photos or other high quality images, with text being used sparingly on screen if at all. The research by Richard Mayer (Multimedia Learning) puts forth at least some scientific proof which supports our anecdotal evidence. "Research discussed within this work has therefore evidently substantiated our hypothesis that unlike with current, text–centric slide paradigms, people actually reason, understand, and even learn significantly better from purely visual material. Moreover, particularly persuasion effects see themselves considerably augmented with the application of vivid, realistic, and as such, photographic material..."
In the end, the author states that his hope is to "...contribute to a more intense, public discussion about how particularly software–based approaches might henceforth facilitate the necessary shift “beyond bullet points” in presentational visualization." If nothing else, this work provides a very good bibliography pointing to myriad works from various fields related to presentation. I have not had a chance yet to read the entire thesis critically, but there is no doubt that this paper will contribute to the on-going discussions concerning the best ways to present and the role of slideware. 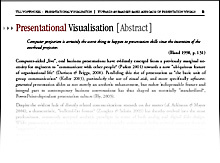 Download Voswinckel's entire 153-page thesis, "Presentational Visualization." One tip to people interested in this approach: don't use made-up fancy words like "visualistic" when there are perfectly good real words available. "Visual" is the correct word here.